I admit, it's probably not the best choice for a bedtime story book. Aliza was reading this last night before going to bed, and then I heard her crying. She spent too much time looking at the page about sharks, and decided she's now terrified to get into the YMCA swimming pool for swimming lessons this morning. After 7 weeks in the Guppy class and 7 years of a serious love affair with all pools, sprinklers, and waterparks, she's done. I can't decide whether becoming unhinged by a picture of a shark at age 7 is something I should worry about. If she were 3 or 4, I'd would understand completely how scary the picture is. But a 7-year-old should be able to go swimming at the Y without visions of shark attack. She suffers from a vivid imagination, poor child. This morning we've ix-nayed any shark talk. She plans to go to swimming lessons. 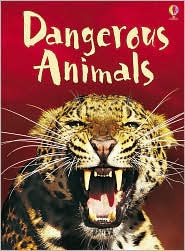 And I've tucked the Dangerous Animals book away where it can't harm anyone else.